This is a nice watch story about collecting vintage watches. Everybody knows what a NOS watch means, and this one is indeed new old stock, stickers and tags intact, but… the story is not so straight forward. This looks as the day it left production, a NOS Citizen watch, no scratches, clean sharp lines, perfect bracelet, no dirt, perfect acrylic crystal, perfect dial, perfect hands, stickers and tags. And we are talking about an old watch, made in 1969. Let’s see the watch! The dial is simple, grey, with a sun burst pattern with a date at 3 and the day at 12. Both the day and the date frames are applied and so are the Citizen logo (under the day frame), the baton hour markers (double for 12 o’clock) and the “7” badge at 6 (between the writing – “Crystal Seven” and “33 jewels”). The movement, and now the plot thickens, inside this gorgeous NOS Citizen is… the Citizen NOS calibre 5270, with… 21 jewels! What?! Why is it written on the dial 33 jewels and the watch model suggest it is a 21 jewels movement inside? How come inside is not a 5240 (for example) or another 33 jewels movement? I have an idea, but that will be in the conclusion. As for the calibre 5270, it is an automatic, with a nice black rotor, 21 jewels, that can be winded by hand also, with a day and date function. The bracelet is a beautiful brushed with two polished longitudinal lines. It has folded links and closes with a beautiful satined (as most of the vintage Citizen should have) clasp. The clasp has a raised polished Citizen logo with sharp lines and edges. Pearl white dial, classic face, 3 hands, no luminous material, right size, hand winding, black leather strap… This is the iconic suit watch design. Looking for an elegant look? Well look no further! 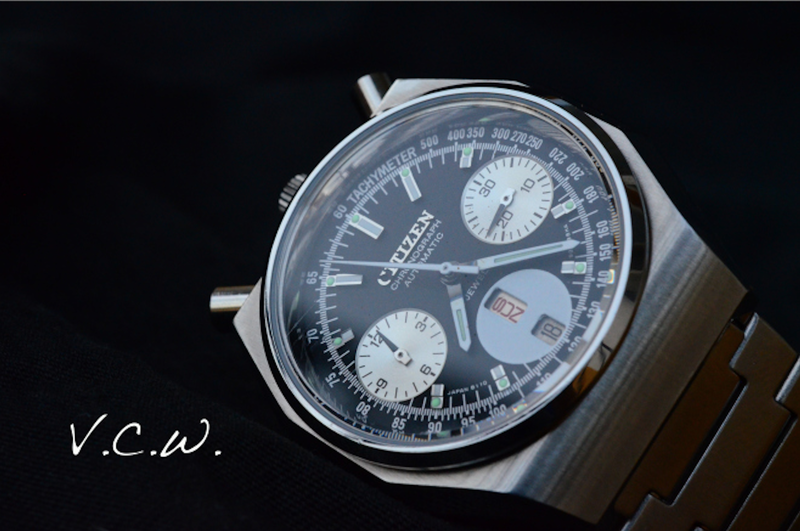 This is the vintage Citizen reference 63-5537. You have to see it in person to fully appreciate the underrated pure beauty. It is more than words can describe. Sublime! The case is stainless steel, with elegant lugs, polished entirely, 36mm diameter. The lugs are a little bit twisted, narrowing towards the end. They are perfectly integrated in the overall design. The bezel is polished too. The acrylic crystal is domed. The crown is signed “CTZ”. The dial is pure class; white, pearly, silver, sunburst pattern. On the upper part it is written “Citizen 17 jewels” and on the lower part “waterprotected unbreakablespring shockproof”. All this sounds like a lot of writing but it is not too much and not overwhelming at all. There is no luminous material and this is good because the lines are so fine, so elegant, that any luminous dots would ruin the design. The dauphine hands and the hour markers are mirror polished and reflect a lot of light so the legibility is optimal. The markers are wider towards the border of the dial and pointed towards the center. (sharp point for 3, 6 and 9 and without the tip for the others) The 12 o’clock marker has two parallel lines. The movement is hand winding Citizen calibre 0201, with central sweeping hand. It has 17 jewels and a it beats at 18.000 bph. It has a power reserve at about 40 hours. It was used starting from about 1966. This particular watch is from ’69 July. Nothing fancy, just a classic, simple, thin (4mm) hand winding movement. The strap that I used for this watch (aftermarket) is 19 mm, tapering black lizard skin with a stainless steel buckle. I think it compliments the watch nicely without over powering it. It is very difficult to find a watch this old with an original leather strap. Conclusion: This is the ultimate classic elegant vintage Citizen watch. If you wear a suit, well, suit up! The term “Parawater” was the one used by Citizen to describe that the watch was water resistant. 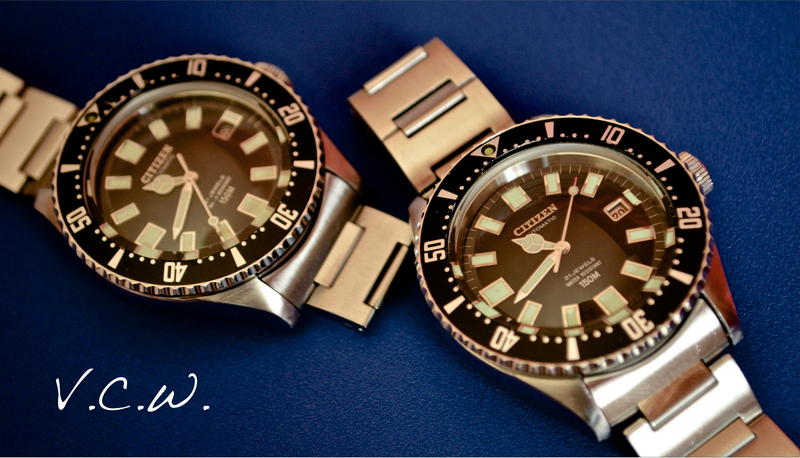 In 1959 the company produced the first Japanese water-resistant wrist watch. This was the “Citizen Parawater”. It was powered by the Citizen Cal. 920(2B). Soon after, the Parawater completed two trans-Pacific tests and one in the Sea of Japan. The result, needless to say, was positive. 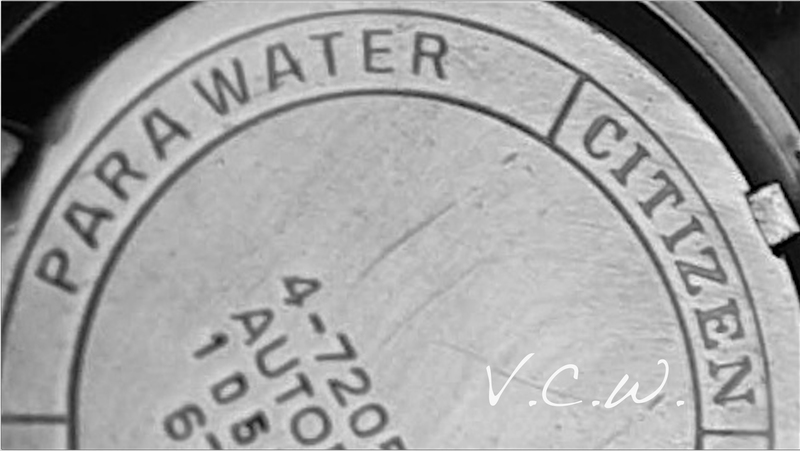 As time passed Citizen was growing as a company and exported more and more watches, so the term “Parawater” was changed to the universally recognized “Water resistant” somewhere around 1970-1973. The term “Parashock” came to life in 1956 when the company produced the first shock-proof Japanese watch, known as the “Parashock”. So first was the “Parashock” and three years later the “Parawater”. The Mayor of Tokyo, Mr Shimpei Goto, named the watch “CITIZEN” with the hope that the watch, a luxury item of those times, would become widely available to ordinary citizens and be sold throughout the world. He got this right. 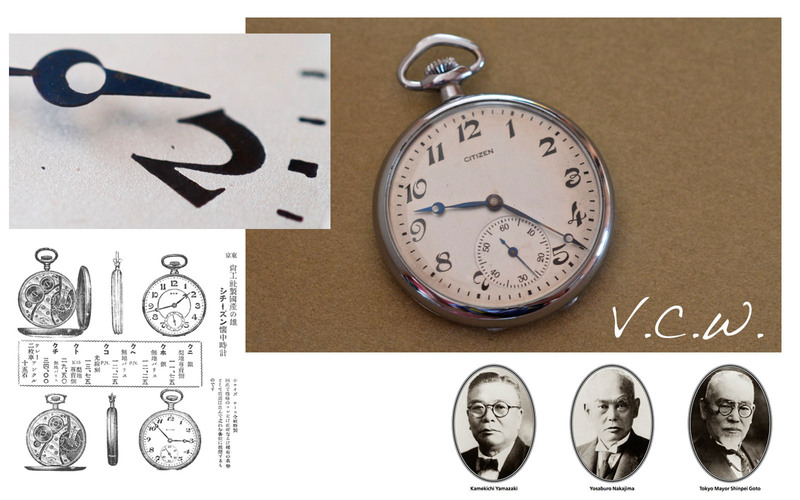 1918 3 Shokosha Watch Research Institute established, the forerunner of Citizen Watch Co., Ltd.
1924 12 First pocket watch completed. 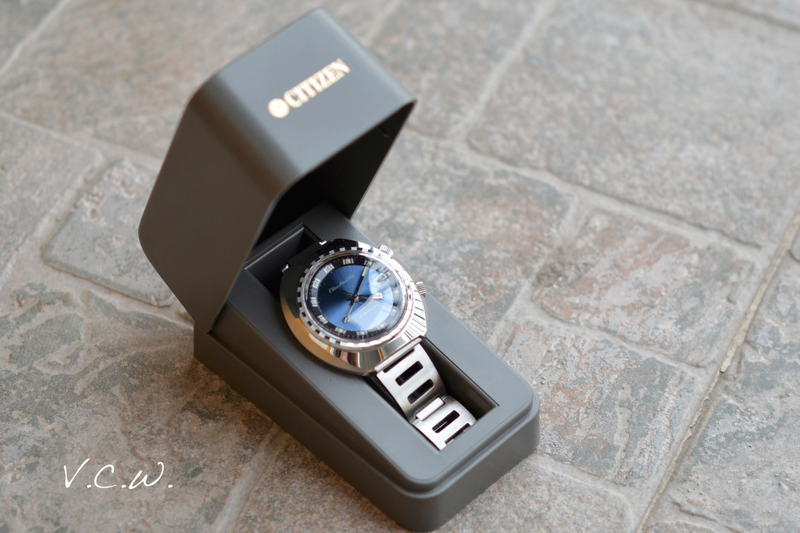 1930 5 Citizen Watch Co., Ltd. established. Yosaburo Nakajima appointed president. 1931 6 First wrist watch completed. 1936 5 Tanashi Factory constructed. 1941 7 Production of machine tools begins. 1945 10 Shinji Nakajima appointed president. 1946 3 Eiichi Yamada appointed president. 1949 6 Citizen Trading Co., Ltd. established. 1952 3 First Japanese-made watch with a calendar introduced. 1953 3 Rhythm Watch Co., Ltd. becomes an affiliate. 1955 12 Export of wrist watches begun. 1960 3 Import-export agreement concluded with the U.S. Bulova Watch Co.
1964 8 Technology research laboratory established. 12 Citizen Business Machines established. 10 Office opened in former West Germany, start of full-fledged exports to Europe. 1966 3 First Japanese-made electronic watch “X-8” introduced. 1970 3 CNC automated lathe “Cincom” developed. 1971 6 Precision Machinery Division established. 1976 3 Production of quartz oscillators begun. 1978 2 Head Office moved to Shinjuku Mitsui Bldg. in Tokyo. 1980 6 Industry’s first microcomputer controlled line impact printer introduced. 1981 6 Rokuya Yamazaki appointed president. 10 Systems and Peripherals Division established. 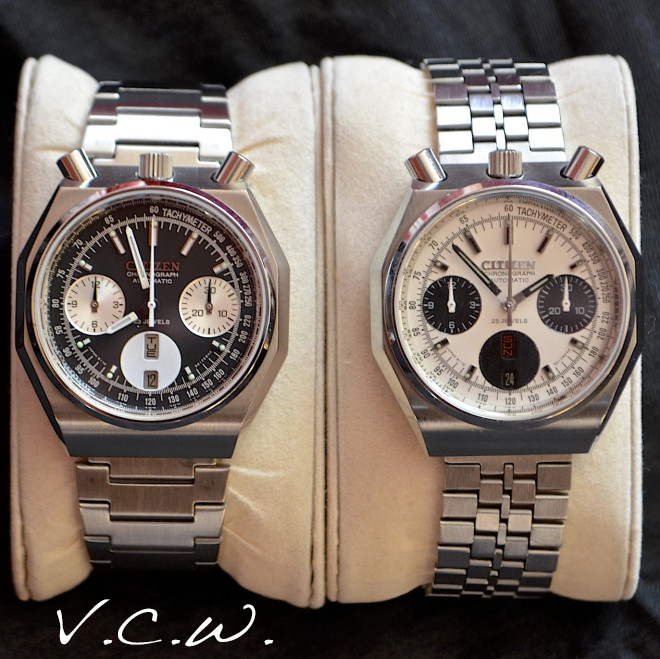 1982 9 Special Sales Division established, full-fledged sales of watch components started. 1983 3 Chip LED lamp CL Series developed. 5 IC sensor electronic thermometer introduced. 1987 6 Michio Nakajima appointed president. 1990 1 Citizen of the Year annual award established. 1992 2 Acquired German machine tool company, Boley GmbH. 1993 5 World’s first multizone “Radio-Controlled Watch” introduced. 1996 4 Solar-powered Eco-Drive received the Eco Mark the first for a watch. 1997 6 Hiroshi Haruta appointed president. 2001 3 Head Office moved to Nishi-Tokyo. 2002 3 Sales of white LED as a backlight for color LCDs started. 6 Makoto Umehara appointed president. 2003 6 World’s first full metal case radio-controlled watch with built-in antenna introduced. 2004 1 Implemented Citizen Code of Conduct. 10 Merged with Citizen Trading Co., Ltd.
2005 4 Citizen Systems Japan Co., Ltd. established. 10 Five consolidated companies (Citizen Electronics, Miyota, Cimeo Precision, Sayama Precision Industries, Kawaguchiko Precision) become wholly owned subsidiaries. Names of Citizen Group companies changed. 2007 4 Company name changed to Citizen Holdings Co., Ltd.
2008 4 Mitsuyuki Kanamori appointed president. 7 Citizen Miyota Co., Ltd. and Citizen Finetech Co., Ltd. merge. 10 Miyano Machinery Inc. becomes a consolidated subsidiary. 2011 4 Citizen Machinery Co.,Ltd. and Miyano machinery Inc. merge. 2012 4 Toshio Tokura appointed president. The forerunner to what we now know as The Citizen Watch Co. Ltd., began life in 1918 under the name Shokosha Watch Research Institute. Buoyed on by an ambitious Mayor who demanded that the Shokosha-Watch Institute should have a bearing on all citizens, in so far as “people appreciated and benefited from the institute’s results”. Prophetic words indeed – from this statement, the seeds were sown that would help produce the world’s largest watch manufacturer. In 1924, the first pocket watch to bear the Citizen moniker was produced. One of these first products produced by the company was purchased by Emperor Showa, Prince Regent at the time (Emperor Taisho era). In 1930, Yosaburo Nakajima laid the foundations of the Citizen watch empire. In 1931, a 10½ ligne caliber is in production, followed in 1935 by an 8 ¾. 1936 saw the company expand beyond the boundaries of Japan, exporting watches to many parts of Southeast Asia. In 1940 a 5 1/4 ligne caliber was introduced. During World War Two, Citizen moved their production facilities to a small town 200km from their former location in Tokyo. The company manufactured many components, amongst which were chronometers and igniters for military use. 1949 saw the creation of The Citizen Trading Company. This entity controlled the distribution and marketing of Citizen watches throughout the world. In the early part of 1950’s, Citizen completed Cal. 960(M), its first 6 beat caliber with 17 jewels, and Cal. C, Japan’s first men’s wrist watch fitted with date display known as “Citizen Calendar”. In 1953, Citizen acquired a clock manufacturer, The Rhythm Clock Co. (currently named “The Rhythm Watch Co., Ltd”), as an affiliated company. 1956 was a momentous year for the brand. The company produced the first shock-proof Japanese watch, known as the Parashock. In 1958, the company produced its first automatic-winding wrist watch “Auto” fitted with Cal.3KA, and Japan’s first manual winding alarm caliber with 19 jewels, Cal.980(A). Also the introduction of “Citizen Deluxe” fitted with Cal.920, Citizen’s first caliber with central seconds, proves a hit with the watch buying public, with sales of over 100 million pieces. 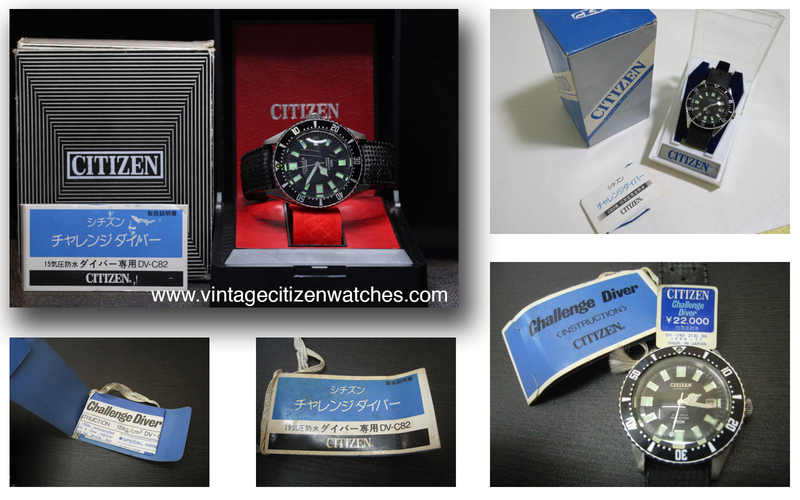 In 1959, the company produced the first Japanese water-resistant wrist watch, the “Citizen Parawater”, Cal. 920(2B). At the start of the 1960’s, the Parawater completed two trans-Pacific tests, as well as one in the Sea of Japan – all passed with flying colors. 1960, Citizen signed an export/import agreement with USA’s Bulova Watch Company. 1962 saw the company introduce an officially certified chronometer and the world’s thinnest men’s wrist watch with center seconds, the “Diamond Flake”, Cal.0700. The year 1963 heralded the introduction of the Quartz-transistor clock. 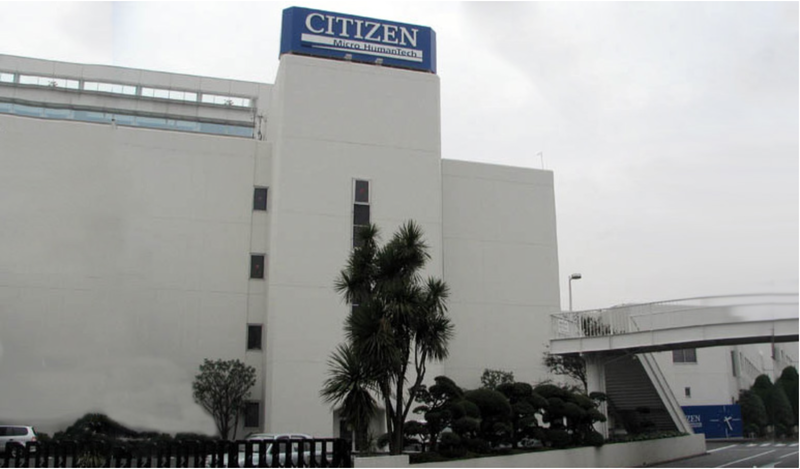 In 1964, pursuing a diversification strategy, Citizen founded the Citizen Office Machine Co., Ltd. (today’s Japan CBM Corporation). In 1965, Citizen started producing office equipment and precision manufacture components. 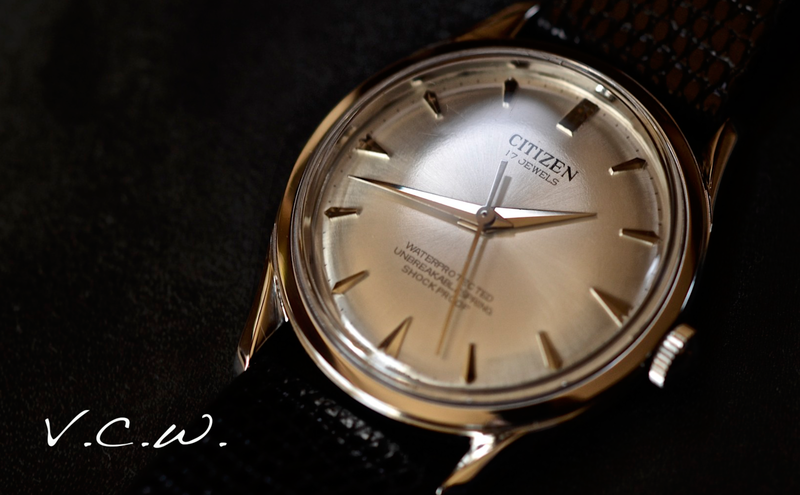 In 1966, Citizen introduces Japan’s first electronically regulated balance wrist watch known as “X-8” or “Cosmotron”. 1967 saw the company put the world’s first quartz transistor clock into the market. 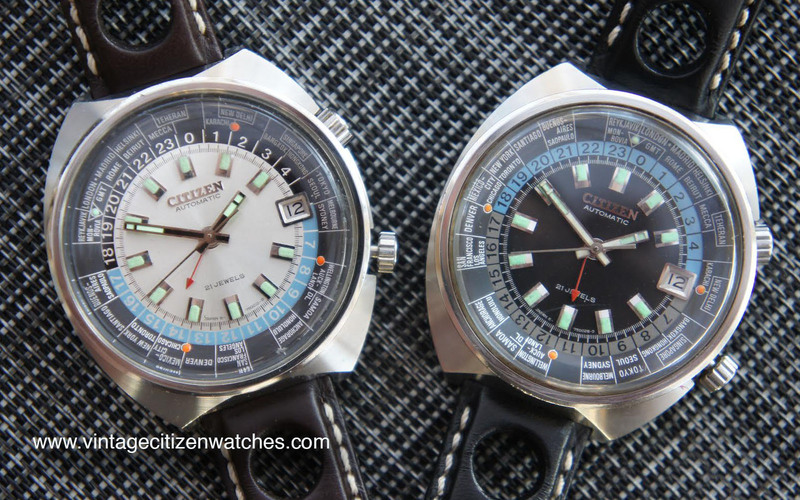 The 70’s were another prolific decade for Citizen, and also the beginning of the company’s move towards the quartz technology that dominates its current output. However, Citizen did not completely move away from mechanical movements during this decade. 1970 saw the introduction of the world’s first Titanium cased watch “X-8 Chronometer”, followed by a tuning fork caliber a year later. 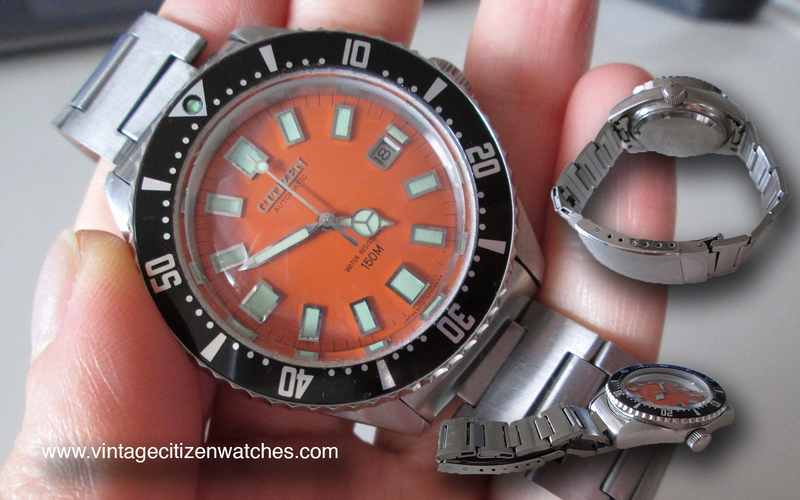 In 1972, Citizen evolved the 60’s “Sports Master”. They developed an brand new automatic chronograph, named the “Easter Rabbit” – commonly referred to by English speaking collectors as the “Bullhead” (or the “Panda” in Japan). The “Easter Rabbit” showcased calibre 8110, which included a zero-position reset mechanism fitted with a shock absorber. In 1973, the company launches its first quartz wrist watch, fitted with Cal. 8810. During 1974, Citizen signals its intent to seriously pursue quartz technology by introducing a quartz movement, Caliber 8600EX, fitted with Japan’s first stepping motor mechanism*. By 1975, the launch of the now legendary Crystron Mega Quartz left the watch world with little, if any, doubt about where Citizen were heading as an brand. Fitted with caliber 8650, generating a frequency of 4,194,304Hz, it is still to this day one of the world’s most accurate (and priced at approx. Y15,000,000 one of the most expensive) wrist watches ever offered for public sale. 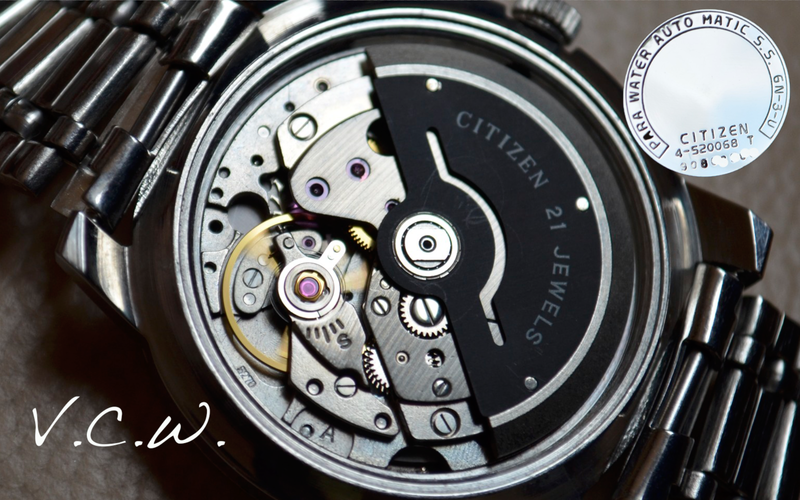 In 1975, The Citizen Watch Co. of America Inc. is established. In 1974, solar powered technology is first introduced, not to mention the first Japanese LCD technology watch. 1978 saw the company introduce a 0.98mm thick quartz caliber, “Quartz 790”. By 1978, the company moves to the Shinjuku Mitsui building in Tokyo, followed in November of that year with the release of the Citizen Quartz Digi-Ana, fitted with caliber 8900 – it featured a combination of digital LCD and analogous time indication. By 1980, Japan had become the world’s largest producer of watches and watch movements. November of this year brought the release of ladies wrist watches fitted with the world’s smallest volume movement, “The Exceed Gold”. 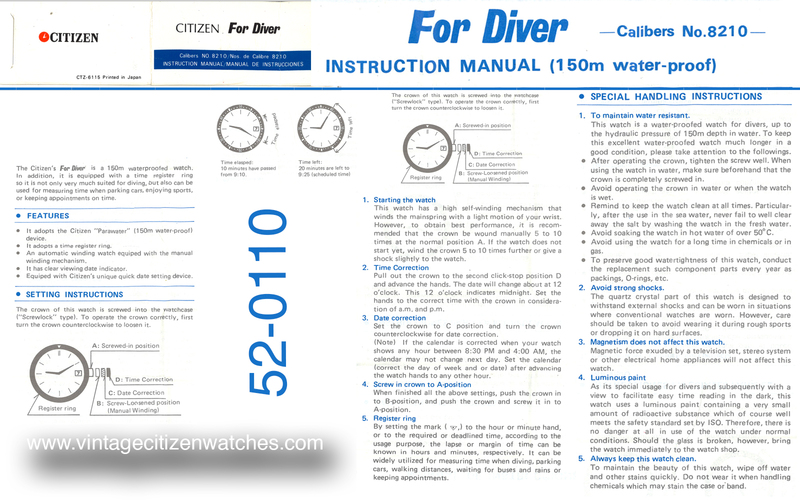 Towards the end of 1981, Citizen released their 1300m Professional Diver’s watch. At the time, it was the world’s most water resistant watch available for public use. By 1982 the diversification that started in the 1960’s, saw Citizen produce the world’s largest Neon-Light advertisement installed in Hong Kong. 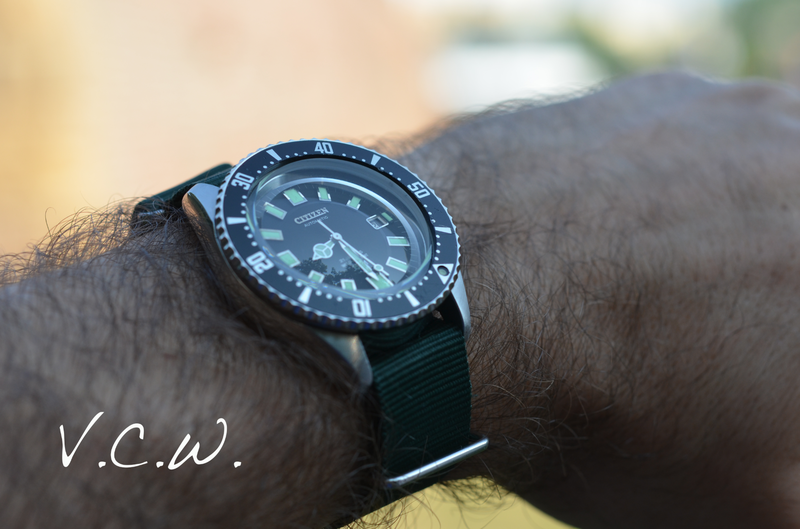 1985 saw the release of the world’s first watch fitted with a depth gauge, the “Sport Depth Meter”. 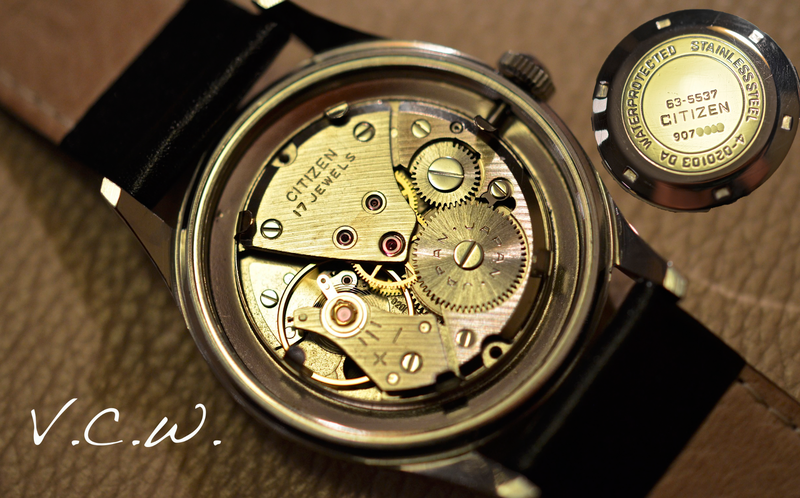 By 1986, Citizen becomes the world’s largest single manufacturer of watch movements. In 1987, the company introduced the “Voice Master” or “Voice Memo” (in Japan)”, VX-2, the first wristwatch with voice recognition. The 1990’s were almost as significant and prolific in terms of world’s firsts than the 70’s were for the company. 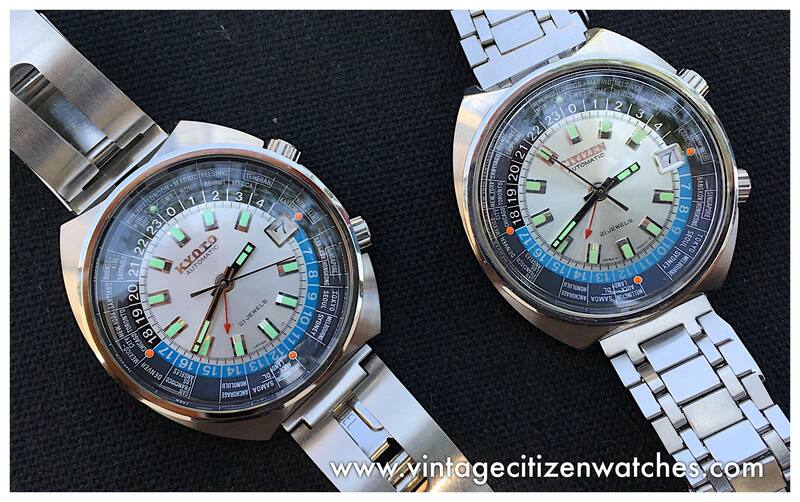 In the early 1990’s Citizen launched the Analog-Aqualand, the first quartz watch with an analog depth gauge. In 1992 Citizen became the official timekeeper of the America’s Cup yacht race. 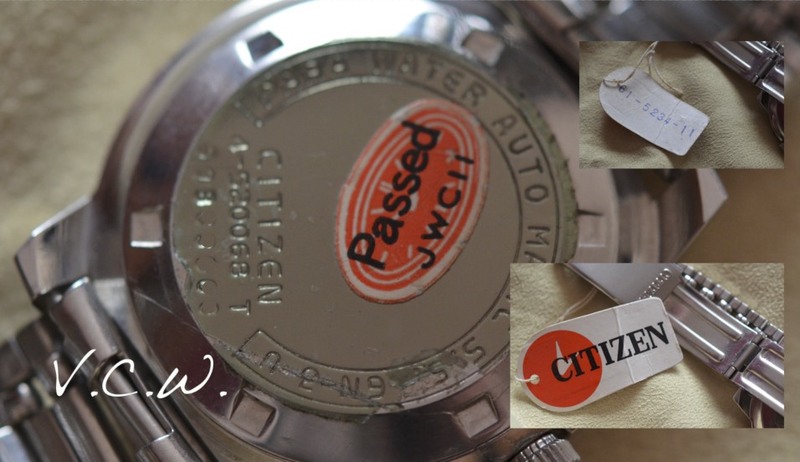 In 1993, Citizen introduces radio-controlled watches to the market place. 1995 saw two significant additions to the world of Horology: “The Citizen” was released in May, backed with a ten year factory warranty and +/- 5 second a year accuracy; and November saw the introduction of Eco-Drive power generating technology, which quickly became Citizen’s number one seller. 1996 was another busy year. Citizen’s Eco- Drive technology was awarded the first “Eco-Mark”, an officially certified Japanese award for environmental protection. In July Citizen released the world’s thinnest solar cell equipped movement, only 3.14mm thick. In 1997, Citizen launches the “Exceed Eco-Drive” to the Japanese market, featuring accuracy of +/- 10 seconds per year, followed closely by “Eco-Drive Signature Technology”, which corrects time differences when traveling between time zones. 1998 saw the introduction of the “Promaster Eco-Drive Aqualand” or “Promaster Aqualand Eco-Drive Analog Depthmeter” (in Japan) , the world’s first solar powered diver’s watch with an electronic depth gauge. In October, Citizen unveil the world’s smallest quartz movement, fitted to the Exceed Lady’s Eco-Drive. By the end of the millennium, Citizen introduced “Promaster Eco-Drive Super Tough”, which can survive/withstand/resist the shock of an impact hammer 5 times more than non para-shock watches. – Introduced the Campanola range of High End Quartz watches. – On January 10th 2008 Citizen acquired USA’s Bulova Watch Company, including all its affiliated brands (Bulova, Caravelle, Wittnauer and Accutron) for US$247 million, making the combined company the world’s largest watchmaker. *EDIT – Switzerland’s Girard-Perregaux hold the record for the worlds first stepper motor equipped quartz wristwatch. Citizen Watch Co. of America Inc. I would like to thank to all involved in putting together this information and I hope that the amount of known data that will be available will grow constantly. Let me show you my first vintage Citizen Alarm Watch. 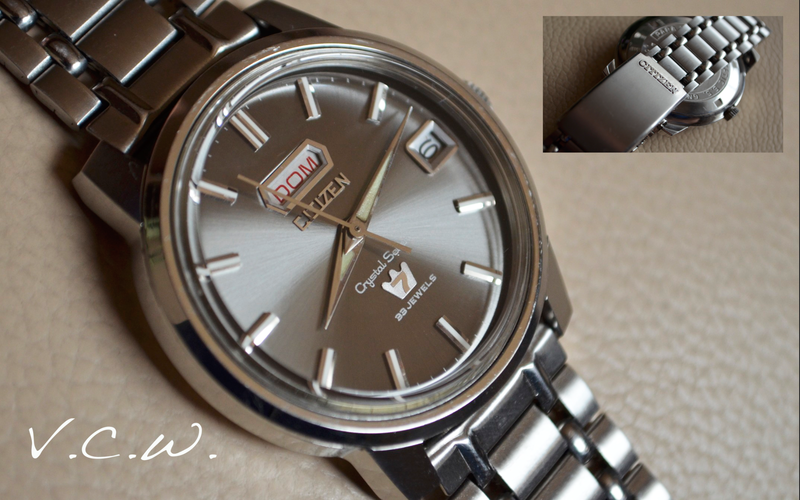 This is the stainless steel model, the Citizen reference 67-7050, and it is really loud! One of severals designs that is used by Citizen to fill the gap for alarm watches. This one is my favorite (I will write about some other models), with a blue sunburst dial, the cushion shaped case and this particular vintage bracelet. I love the sound of it, i love the feeling when I wear it and it vibrates. I often set the alarm just for the pure pleasure of hearing it. The case is, as usual, made of stainless steel, with a polished frontal part and brushed sides, in a sunburst pattern. 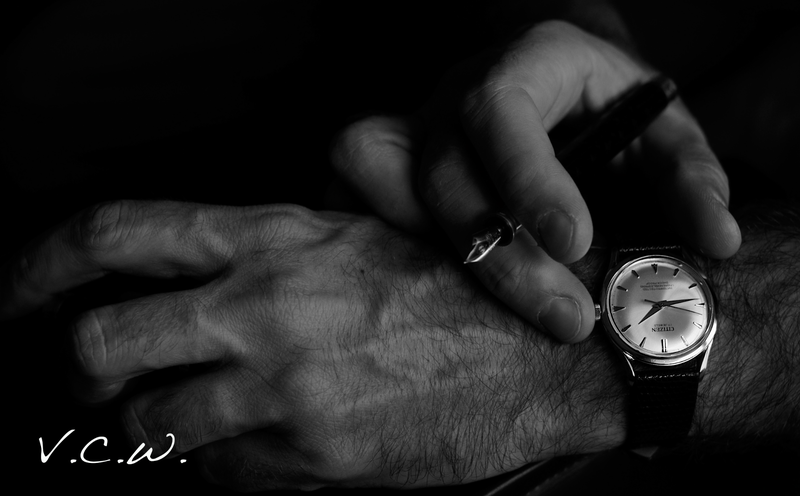 It is a relatively large watch with a nice wrist presence. The bezel is spectacular, with a combination of polished raised areas and sandblasted lowered square areas. It accommodates two crowns, one for setting the alarm and one for setting the time and date. The crystal is acrylic,domed, with a magnifier for the date. The dial is the most beautiful part of this watch, bright blue, with a sunburst pattern, white (handwritten characters) writing. There is an outer black ring that has the hour markers, with luminous material (still working today). The date window (red digits) is a t 3 o’clock, inside a painted white frame. The hands are simple, with a luminous part at the extremities, and the alarm is shaped as an arrow with a triangle inside a circle tip. The dial is bouncing the light in so many different ways that you have to see it in person to fully appreciate the entire beauty and finish. 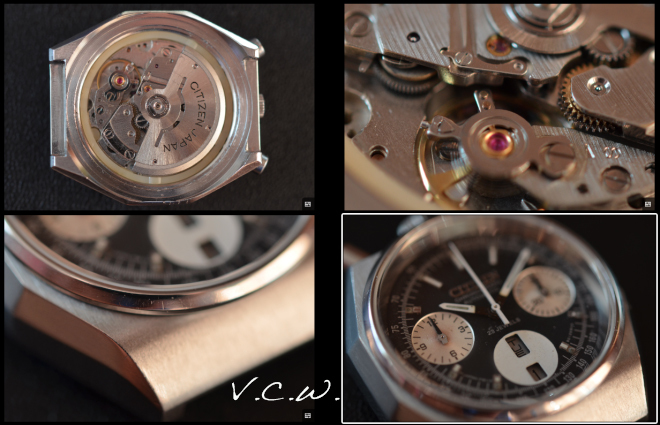 The movement used is a handwound movement, based on the famous USSR calibre AS 1475. There are the calibres 3100 and 3102 (date), 21 Jewels, 18000 bph. This one is the Citizen calibre 3102. The crowns are for the time and the other for the alarm. The crown at 2 o’clock in first position is winding the alarm and the alarm is deactivated. If you pull it in the second position you can set the alarm (counterclockwise) and the alarm is activated. Pressing it while the alarm is ringing will stop it. The crown at 4 will wind the watch and pulling it out will set the time. The alarm will ring for 13-16 seconds. The bracelet is shared with other vintage Citizen models but has an interesting design with curved large perforated links. Nothing much to say about it, but for sure it is well integrated in the general watch design. The clasp is stainless steel, signed (as usual). The box is small, made of plastic and looks like this. It is very rare for a watch to be found with it’s box after all these years. Conclusion: Beautiful design, beautiful dial, loud sound. A true vintage timepiece with an alarm complication. This is the “GMT” version of Citizen vintage watches. In fact it is not a real GMT but rather a world timer, and this is actually it’s name . The dial is silver with applied Citizen logo and hour markers. They have green luminescent material applied. There is luminescent material on the hands too, except for the seconds hand that is polished and the “GMT” hand that is short and painted red. The 24 hours ring might be all black or half blue, half black (just as the 2014 released Rolex GMT – ceramic bezel – 40 years later). I have seen it also with a black dial. The KYOTO is the same as Citizen but it was made for France. There was a time when Citizen was not allowed to use Citizen name so it used to sell there by the Kyoto name (very rare watches now). The movement is automatic with hand winding capability, hacking seconds calibre 7450, with 21 Jewels. Just as all the other Citizen movement this one is nothing fancy, just a simple working, reliable one. As time passes, you learn to really appreciate the simplicity of Citizen movement, the sound of it, the movement of the hands… The date is quickset and it beats at 21.600 bph. The year this one was introduced was 1971. The nice thing about this movement is that added to the three classic hands, there is a forth one (the red small one) that is circling the dial once every 24 hours. In order to operate the Worldtimer function you need to use the 24 hours hand and the inner bezel. You have to rotate the inner bezel until the timezone where you are in is opposite to the 24 hours hand. Then you have to look for the city you want to know the time in and read the time on the inner 24 hours ring, next to that city. Update 2016 Apr: Mikko was kind enough to provide me a few pictures with his awesome black and white dial watches side by side. He also noted one particularity. In my watch we have “Central Europe” as in his it is ” London Madrid Rome” in the same space. Conclusion: A real traveller watch, so entertaining to operate, so simple and so clever, nice wrist presence and gorgeous!